The Falcons returned only one starter from last year, but are once again among the top teams in Class B South. 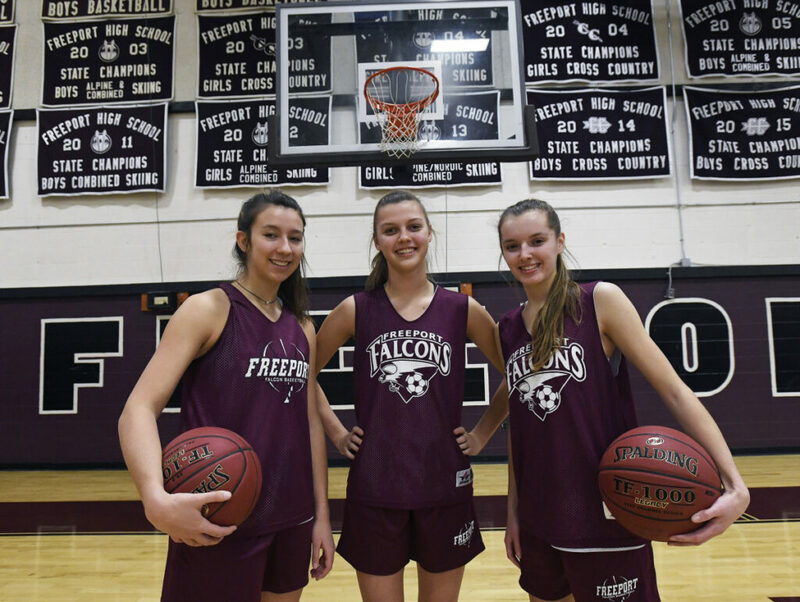 FREEPORT — The best girls’ basketball season at Freeport High in over four decades ended in the Class B South championship game last year. The upstart Falcons were beaten by Lake Region, 42-34. And with four starters graduating, expectations weren’t necessarily high for the current season. Yet, as the regional basketball tournaments are about to begin, Freeport is right back on center stage. The Falcons, who don’t have a senior on their roster, finished the regular season 14-4 and in third place in Class B South. Their losses were to top-ranked Gray-New Gloucester (twice), fifth-ranked Wells and undefeated Class A power Greely. To those on the outside, the Falcons certainly exceeded expectations. But to first-year coach Seth Farrington it’s simply a result of the dedication and commitment of his players. There were times, he said, when there were over 20 players attending summer workouts. “The players are just a great group of kids,” he said. “They work hard, they’re unselfish. They’re at everything, they’re committed. They’re a tight-knit group. This is a resilient team. There have been at least seven games this year, according to Farrington, when the Falcons have either been tied or in a one-possession game in the fourth quarter. They’ve lost one. Farrington, too, has made a difference. Junior guard Caroline Smith, the lone returning starter from last year, said he has “sparked a new belief” among the players. Smith is undoubtedly the Falcons’ leader with team highs in points (18.1 per game) and assists (2.8) and second in rebounds (6.8) and steals (2.5). Yet you’d never know she was the star. After she scored a career-high 35 points in a 49-41 win over Yarmouth last month, she first thanked her coach and teammates for putting her in position to do well. Wall is the second-leading scorer with 10.9 points and leads the Falcons in rebounds with 7.7. Junior point guard Catriona Gould averages 5.0 points, 4.1 rebounds, 3.5 steals and 2.5 assists. Freeport players often look to make the extra pass or help a teammate who might be struggling. “Everyone’s doing what’s best for the team,” said Smith.